One of the most common questions I hear over and over from clients is, "How many repetitions should I do of each exercise?" At that point, I usually launch into a lengthy explanation of why I don't give a number. Part of the length of this explanation comes from my anticipating that someone might be confused and frustrated if I just say "We don't count reps" and leave it at that; part comes from my firm belief that healthy criticism and curiosity are important for a smart attitude, and we should all understand why we do what we do. So, here is my lengthy explanation in a nutshell: Pilates is different from other forms of exercise because it deals mostly with precise movements. Instead of measuring progress by the number of repetitions we can do, we measure progress by how well we can perform each exercise. In other words, how is your quality of movement? Most of us have never come into contact with this level of precision in our workouts. The idea of paying more attention to the exact position of the shoulder blades during plank or to the head or hip position during abdominal curls than to the number of reps might feel strange at first. However, you will improve your strength and body function by doing only five repetitions of an exercise but paying more attention to each exercise. If you stabilize each joint, optimize the breathing pattern, and stay vigilant about not allowing any compensation patterns, you will recruit much more of the desired muscle strength per exercise. This will create more efficiency, less strain, and a greater improvement overall than a higher number of reps without precision. Here's an example: Without this high level of attention to exact movements, you might recruit only 50% of the muscle that you intend to target in any given exercise. The other 50% of the exercise will be other muscles trying to compensate for an unstable set-up. Not only does the targeted muscle not get as much work, but you're also more likely to get injured. Improve the quality of the movement and you might be able to use the desired muscle at 80% instead of 50%. In order to do this, you have to pay more attention. For most of us, this means we need to begin with a simpler exercise that we can perform easily so our body is not required to use compensatory muscles. Our egos like to get involved here (the ego loves to count reps!). This is a good time to remember that less is more. Plus, working with attention and stability actually ups the difficulty of the exercise. I can't tell you how many times I've heard this from my students when I correct their form: "Oh, it's much harder this way." Yep. In addition, when we count reps, increasing the number of repetitions often times becomes the only goal. We're no longer primarily looking to increase the strength of the muscle; we just want to hit our goal. Paradoxical, I know, but the mind is a very literal thing. If we tell it our goal is to hit a certain number of reps, that is what it focuses on. It doesn't really care so much how we get there unless we make the getting there the goal itself. 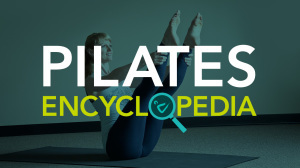 In Pilates, how you get there is the goal itself, so we never lose sight of the fact that our ultimate destination is continual health, easy movement, and a pain-free body. And this means precision in each movement. Working with this level of precision also means we need to be in touch with our bodies. I know this might sound a bit esoteric, but basically it just means we need to pay attention. When we're counting repetitions, we can't be present in the same way. We're too focused on counting. Instead of using the mind to go down a numbered scale, we can put it to much better use by reminding ourselves to draw our abdominals in and to slide the shoulder blades away from the ears. I’m sure you’ve noticed that your form is not the same every day. Some days you’re extremely strong, and other days you’re super tired or feel much weaker than usual. Honoring the body’s needs is far more important than counting reps. I’m assuming, of course, that I’m not talking to a professional athlete. I’m assuming your life revolves around many things other than working out: you have a job or full-time commitments, responsibilities, people who count on you. And if your paycheck comes from anything other than your workout, it’s more important to be safe and honor your body’s condition on a day-by-day basis than it is to beat your own personal records. As for me, I have totally stopped telling my students how many reps they should do in any given exercise. Does that mean occasionally we're not doing the same number of repetitions on each side? Yes. Joseph Pilates originally called his system "Contrology," and for good reason: it's all about controlling each movement. When we do this fully, we own our own body and we can ask it to do anything. It will be at our disposal any time, all the time. That sounds pretty sweet to me. Sometimes, we exercise in an intentionally imbalanced way in order to bring the body back to symmetry. For example, if I'm working with someone who has significant imbalance between the two sides of the body -- sometimes a result of scoliosis, but also for many other reasons -- I have them do the exercise on the weaker side first, then on the stronger side, then repeat only on the weaker side. This is the same for flexibility: we might stretch the tighter side more than the more flexible side by doing a spinal twist first on the left, then on the right, then repeat the left side. In other words, we might do twice as many reps/stretches on the weaker/tighter side in order to slowly even it out with the stronger one. The most important part of all is safety. I was going through a pretty tough program on the reformer the other day and I was thinking about this whole counting repetitions issue. I’m totally aware that a lot of people will protest this. So I decided to test what I preach. I told myself, Okay, I’ll do 5 more repetitions of the exercise that I’m doing rightnow. (I guess I wasn’t very present right then.) And I almost fell off the darn machine! What happened was I pushed myself further than my muscles were ready to take me. That’s the moment when we can get injured. So, please stop caring about how many repetitions, and start worrying about your safety. You don’t have to push: you can step safely out of your comfort zone. One of my male clients recently told me he had realized why more men don't practice Pilates. He suggested it's because Pilates deals with all this subtle stuff, and men prefer to get hit over the head with a hammer. (His words, not mine!) I don't know if that's the case. Men, what do you think? I'm really curious to get your input. If you're unsure when to stop with an exercise without a rep number to shoot for, check out the Control Scale I created to can help you determine this.